Through your kind donation today you share a lifeline to the horses! We hope you enjoy your visit here to the Spirit Acres Farm website, we extend our deepest appreciation for your interest and support. 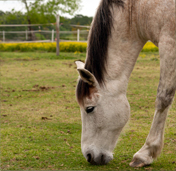 As all gifts and donations contribute to the needs for feed, hay, clean water and medicine and health care support necessary to insure a quality of life for these rescued horses. Please be a positive part of Spirit Acres Farm. For details See the How You Can Help page. Thank you. We were recently profiled on KBTX News!! Spirit Acres Farm is looking for a new home. For more information or to see if you can help, please visit our News page. © 2012 Spirit Acres Equine Rescue | Designed by iEquine Media Inc.